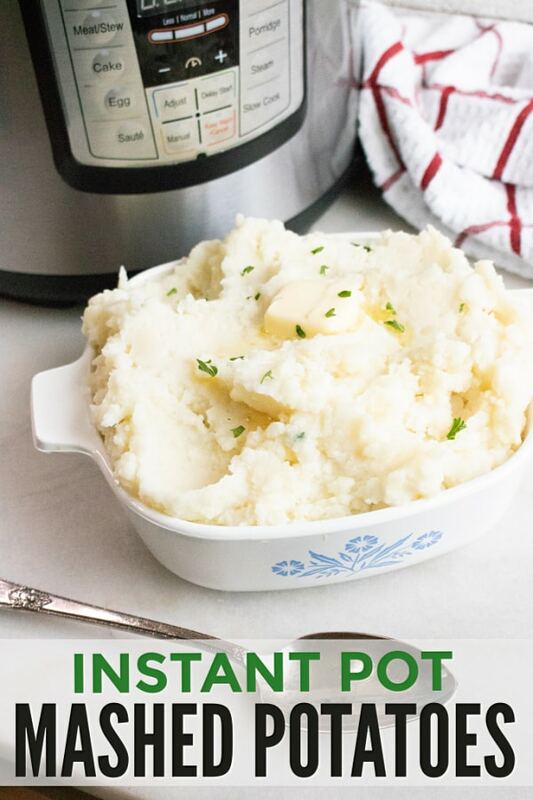 No need to take up space on your stove with a huge pot when you can make Instant Pot Mashed Potatoes instead. 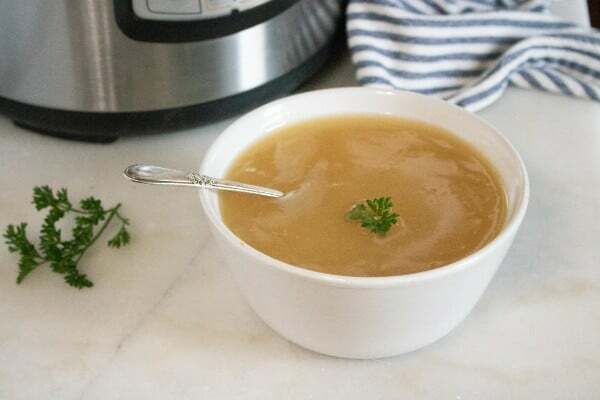 It’s just as easy, perhaps more so, to make them in your Instant Pot. Mashed Potatoes are a favorite side dish in my house. I always make up a giant batch so we have plenty to enjoy with leftovers the next day. At Thanksgiving, mashed potatoes are a must-have at our feast. Because I make a lot of sides for our Thanksgiving dinner, my oven and stove get pretty crowded. That’s why I’m glad I have a 6 quart and an 8 quart Instant Pot to help get the cooking done. 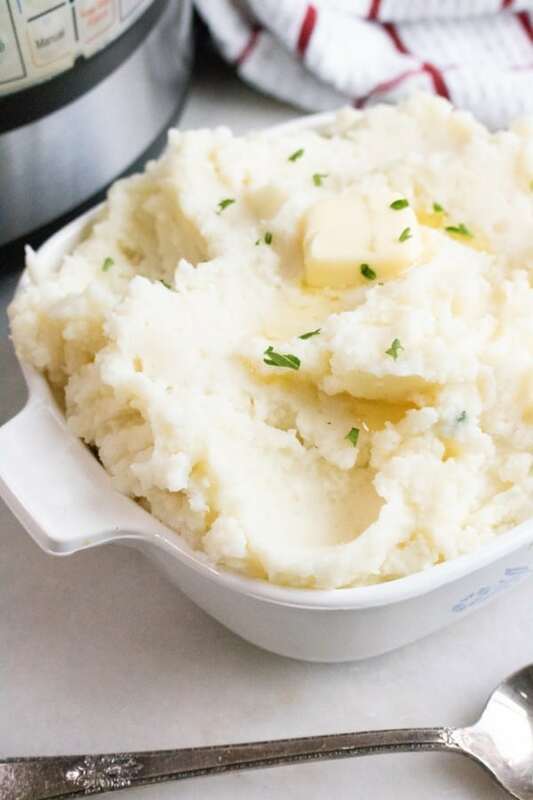 The beauty of making Instant Pot Mashed Potatoes is that since you mash them right in the pot, you can just put the lid back on and keep them warm until you’re ready to serve them. 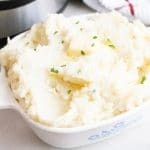 Mashed potatoes are not only awesome because everyone loves them, but also because they’re so simple. All you need to make them are a few basic ingredients. Start with 4 pounds of russet potatoes. 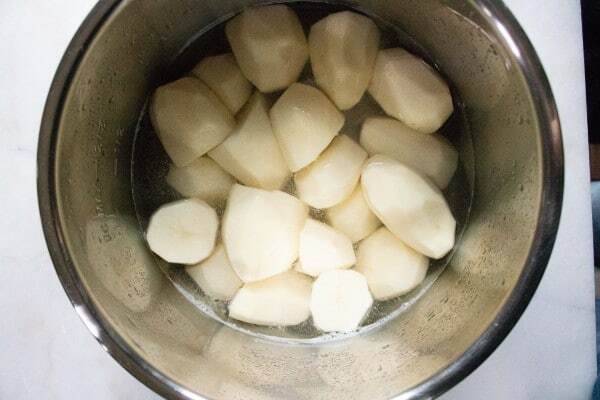 Peel the potatoes and cut larger potatoes in half. Add a cup and a half of water. Now, we’re going to let the pot do the work. Secure the lid, making sure the valve is turned to “sealing” and set to Manual pressure for 10 minutes. When the cook time has finished, move the valve to “venting” to quick release the pressure. After the pressure has fully released, carefully remove the lid. If you like your mashed potatoes, creamy like I do, go ahead and add sour cream, milk, butter, and salt, pepper and garlic powder (if you want). 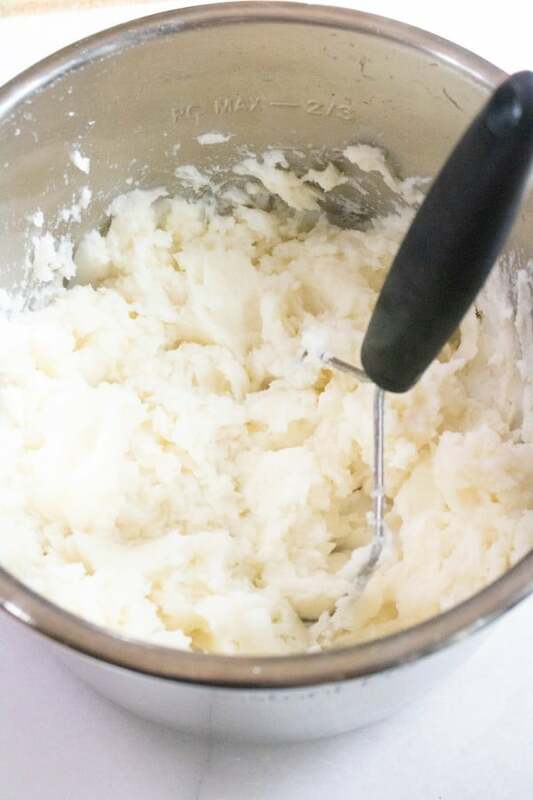 If you want fluffy mashed potatoes, drain off any residual water before adding the other ingredients. 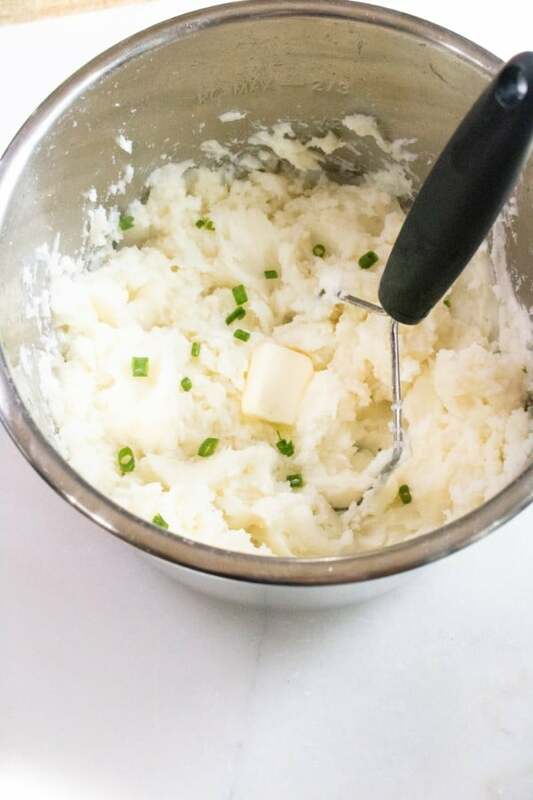 Use a masher to mash the potatoes and mix in the other ingredients. Keep mashing until the potatoes reach your desired consistency. If you like chives, feel free to add them at this step too. 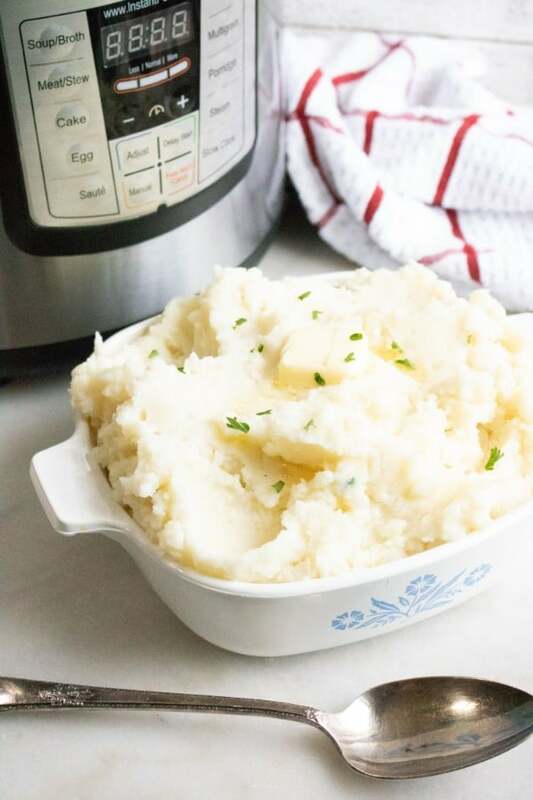 When you’re ready to serve, just transfer the Instant Pot mashed potatoes to a serving bowl. Top with additional chives for color, if you want. 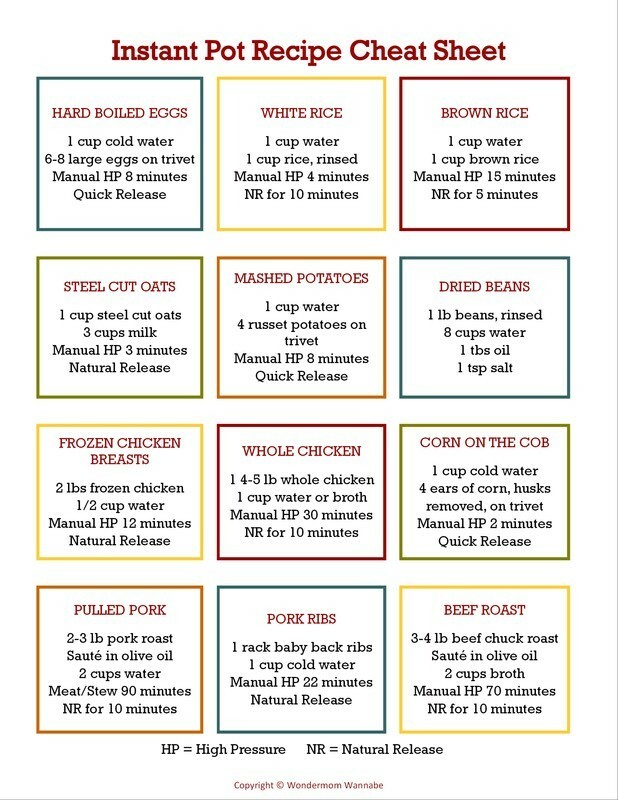 In case you need it, here’s the printable recipe card for Instant Pot Mashed Potatoes. 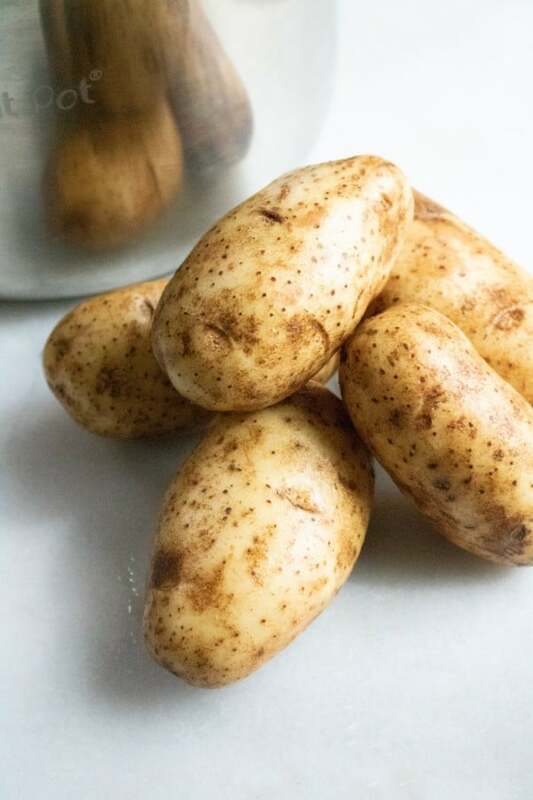 Place peeled potatoes in inner liner of Instant Pot. Add water. Close the instant pot lid and turn pressure valve to seal. Cook on manual high pressure for 10 minutes. When the cook time is complete press "Cancel" and move the valve to "venting" for a quick release of the pressure. After the pressure has fully released, carefully remove the lid. 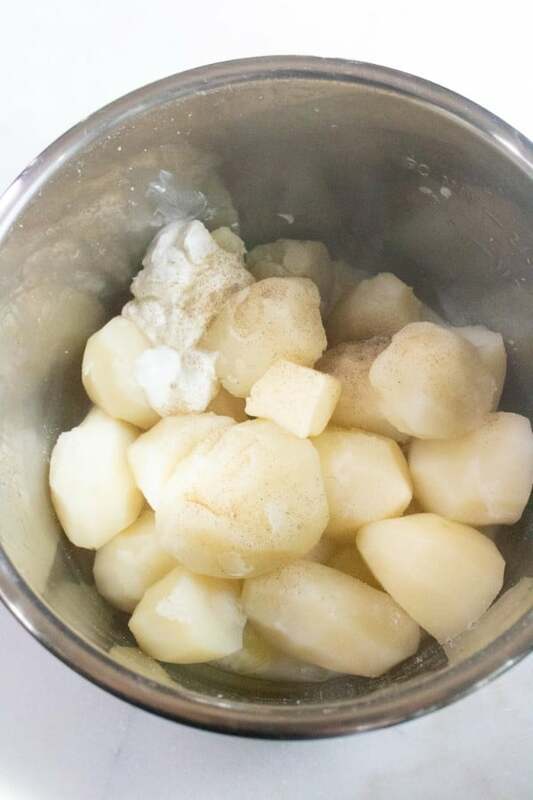 Add the remaining ingredients and use a masher to mash the potatoes and combine the ingredients. Have more than one Instant Pot? Or just want to explore some other ways you can use it for Thanksgiving? 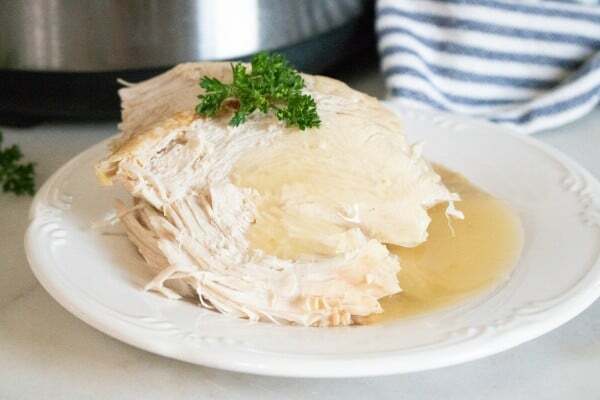 Check out these other Instant Pot Thanksgiving recipes.